(Stillness in the Storm Editor) The Deep State regularly participates in hoaxes, designed to destroy a believers reputation once the truth comes out, thereby making them a social outcast. A good example of this is the flat earth theory, whose proponents are often immediately labeled crazy for their views. The Deep State wants this because they know, for most people, once they reveal their beliefs to the world, they will defend them with irrational fervor, even if later these beliefs are discovered to be false. Most people have a difficult time admitting they were wrong because it feels unsettling. Thus, the Deep State tactic of instilling belief in falsehoods creates a double bind situation—a person has to make a choice to defend their reputation, or admit they were wrong and restore their image. In most cases, people dig their heels in, continue to promote bogus information and suffer social ostracization as a result, which is what they want. Social acceptance is a primal need, inherited from our animal cousins. This urge for social acceptance is built into the human organism—neurologically and psychologically. The Deep State know that they can easily distort a person’s thinking by making them feel abandoned or like an outcast. Once done, a person often becomes even more irrational. Furthermore, a person’s ability to share information with others is severely compromised once they’ve been discredited. Thus, the price for false belief can be devastating, for the individual because they lose social standing and for the collective because it creates division. The Deep State knows our nature better than we do. Hence, gaining knowledge of your nature, seeking to know thyself, is one of the best things you can do to combat the Deep State’s divide and conquer tactics. Finally, the powers that be also know that people can be intolerant and unforgiving of people that don’t agree with them, especially with respect to taboo topics. For the unawakened unthinking masses, there disgust mechanisms (which are designed to protect them using ancient animalistic processes) can be hijacked. They know that most people lack the time and mental acuity to properly evaluate and discern information. When confronted with information one can’t understand, the normal response for someone who has an underdeveloped mind is to reject it, with prejudice. People often rage against things they can’t understand, especially if that thing is something their social group rejects. In this way, a divide and conquer weapon has been perfected. By refusing to learn how to think critically about a topic, a person’s animalistic disgust response, that’s partially responsible for maintaining ingroup status (social acceptance), can be hijacked, causing a person to become violently irrational when confronted with information they don’t understand or believe. Such a triggered person will shoot the messenger to protect their beliefs while also making them feel closer to their ingroup in the process. Whether or not these are Deep State operations isn’t clear. But the destructive effect of hoaxing is the same regardless. Looking back in history, consider the Satanic Panic of the 1980s dealing satanic ritual abuse. Scores of people came forward reporting that they were victims of satanic abuse at the hands of their own family or community members. Mental health professionals, investigators, TV pundits, and most of the general population believed these stories. Several years later, officialdom declared the entire satanic panic a hoax. As a result, scores of people, who believed the stories and rested their reputations on it, felt deceived and slighted. It caused massive division within many different communities. The professionals that considered the reports real, closed their minds to any further claims. Today, most people won’t seriously consider satanic ritual abuse (SRA) in any capacity, even though there’s a lot of evidence suggest SRA is real. In effect, we’re talking about an operation designed to smear or discredit ideas. Once done, even if there’s truth to the idea, people won’t pay any attention due to fear of social ostracization. This tactic can and has been used in to encourage people to avoid thinking about certain topics of information, which makes it easier to manipulate people’s subconscious opinions and therefore their actions. Related Deep State Religion Exposed: Do You Realize You’re Being Initiated Into the Dark Occult? Finally, there is a way to combat these manipulation strategies. By sharing information with integrity (which is to say you avoid claims of absolute certainty, merely presenting your findings as possibly true), you limit reputational loss. Think about it. If you’re just reporting what you’ve heard, it’s not tied to your identity, it’s just something you find interesting. If people attack you, remind them that you’re doing research and you’re capable of changing your mind if wrong. This way, the information isn’t tied to you, it’s free-floating, capable of being removed from your identity with ease. This is a better position anyway because no one can claim absolute certainty. Don’t oversell what you think is true to try to convince people it’s real. Just stick to the truth, stick to the facts—which always come with a bit of uncertainty. What hoaxes have you encountered? Let us know in the comments! It is unfortunate that the world of the paranormal manages to attract all manner of those who would hoax or fake evidence. Sometimes it is to fool everyone, at other times it is to prove a point, and still on other occasions it is to gain some bit of fame or simply just to see what will happen. Whatever the reasons may be, it sometimes seems that for every person who manages to capture what they truly believe to potentially be an authentic photo or video of unexplained phenomena, there is another trying to fake it all, making it sometimes very hard to figure out where the possibly real ends and the hoaxes and fakery begin. It muddies the waters, and requires a vigilance from those who would try and delve into the answers behind these phenomena. 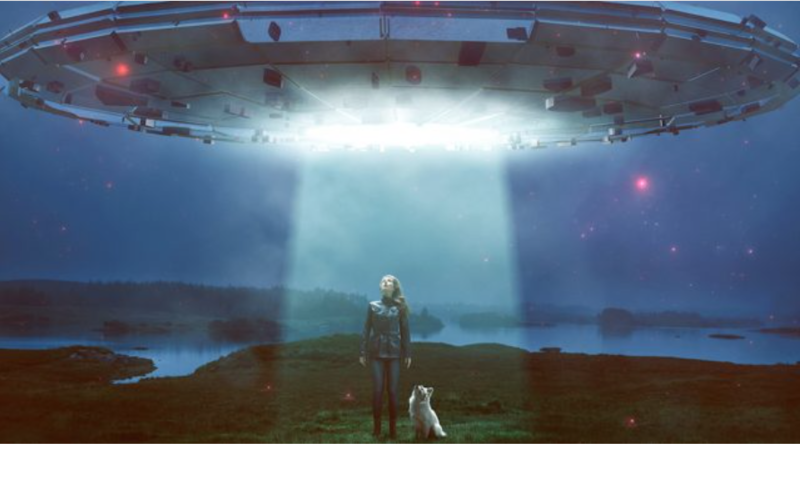 The area of UFOs, like many others, has seen its fair share of such hoaxes, and some of them have been not only rather particularly spectacular, but also surprising in just how thoroughly they were able to fool just about everyone. Here are a few of these cases, very much in the vein of Orson Welles’ infamous 1938 “War of the Worlds” broadcast, that are not only quite intricate and even funny in retrospect, but also show that a skeptical eye is not a bad thing to have. One of the most notable and in retrospect quite hilarious such hoaxes was fittingly orchestrated for April Fool’s Day in 1989 by none other than the billionaire, Virgin Group founder, and incorrigible, unrepentant prankster Richard Branson. Branson was already well known for his elaborate April Fool’s pranks and tomfoolery, but on this day in 1989 he really outdid himself. Called “Project Wedgewood,” Branson commissioned Don Cameron, of hot air balloon manufacturer Cameron Balloons Limited, to create an immense, very realistic looking UFO complete with flashing strobe lights and a sliding door. Branson then boarded the balloon and took off on March 31 along with a dwarf dressed in an alien costume and a whole bunch of dry ice. The idea was to fly the balloon over to London’s Hyde Park and have it land there on April Fool’s Day, April 1st, after which the costumed dwarf would descend through a special sliding door amidst a cloud of dry ice smoke for the “Gotcha!” moment. It was all meant to be good fun, but it would quickly spiral out of control past Branson’s wildest expectations. As they floated over the English landscape along London’s M25 highway towards the destination, it became obvious that there were people stopping their cars and plenty of frightened bystanders gawking and pointing up at the sky at them, with Branson later saying, “We could see every single vehicle grinding to a halt and hundreds of people looking up at the UFO flying over them. It was great fun watching their reactions.” Good fun for them, perhaps, but for the people who were seeing this all it was a different story. Indeed, everyone who saw the balloon took it to be a genuine UFO, and in no time at all there was footage being shown on the news, police and TV and radio stations inundated with calls from concerned witnesses, and residents working themselves up into a mass panic over an alien invasion. It was rapidly launching itself into a media sensation, everyone seriously took this to be an actual alien spaceship, and since Branson had only told a very small cabal of people what he had been up to on the top secret prank there was no one to tell anyone otherwise. It was all so realistic and people were so panicked that the police and military began mobilizing to intercept and deal with what they truly believed to be the real deal. What had started off as an innocent prank was quickly escalating into a perceived national emergency, but Branson and his dwarf friend were oblivious to all of this, not at all aware of the true gravity of the situation. They were up there gleefully giggling at the reactions like some schoolkids when a serious situation was brewing beneath them. The police surrounded us and then sent one lone policeman with his truncheon across the field to greet the alien. The UFO’s door opened very slowly, with tonnes of dry ice billowing from it. A dwarf that we had carried on board, dressed in an ET outfit, walked down the platform towards the bobby. He promptly turned and ran in the opposite direction! The police initially didn’t see the funny side of it and threatened to arrest us for wasting their time. But they soon joined in the general merriment of it. It’s interesting to note that other than perhaps some police purchases of new underwear there were no real repercussions to any of this, and one can imagine that such a hoax in this day and age would at least have led to some arrests and charges. While Branson’s stunt was very well-funded and one of the more elaborate such hoaxes, this sort of large-scale prank had already been done before. In 1967, engineer Chris Southall and some colleagues at Britain’s Farnborough’s Royal Aircraft Establishment (RAE) decided to pull off a hoax that would take the nation by storm. They meticulously crafted six metal-coated, fibreglass saucers composed of two molded halves filled with electronic sound equipment, and Southall said, “We wanted to make something that looked really alien.” The discs were equipped with switches on them, that would flick on when the objects were turned over and start up the sound equipment inside and engage a battery to creating beeping and hissing noises, as well as with a flour and water mix that created a foaming, foul smelling slime when discharged for added effect. We thought the government should have some sort of plan if aliens did land. So we gave them a chance to try out whatever plan they had – but they didn’t have one. One of the saucers when they actually drilled into it, because it was full of this compacted, sort of papier-maché mess, actually exploded and showered the police officers with this stuff. If it had been some kind of radiation hazard, how would they have dealt with that? It would have been a disaster area. And what did they do? Just washed it down the drains. In the meantime, the “UFO landings” were all over the news along with numerous photographs of the discs being carted off by military personnel, and it was a sensation at the time. This was taken very seriously at the time, with bomb squads mobilized and a state of emergency in effect. People believed that these were real UFOs so wholeheartedly, that when authorities inevitably realized that they had been had and tried to tell the frightened public what had happened there were immediate rumors of a government cover-up. It all eventually died down, and amazingly the group who had perpetrated the whole fiasco were let off with nothing more than a slap on the wrist. Again, it’s amazing to think that this incident, which lasted a total of 12 hours, went virtually unpunished, and somewhat tellingly the bumbling response and inability to fully close the area down does not suggest a shadowy government conspiracy that knows of UFOs and has dealt with these things before. Perhaps one of the most famous hoaxes ever was not one involving spaceships, but rather an alleged alien body. The stunt took the form of a video supposedly obtained from a retired military officer stationed at none other than Area 51 in Roswell, New Mexico, by a British music and video producer named Ray Santilli. Released in 1990, the footage is black and white and very grainy, purportedly showing a skinny alien body with large eyes and an oversized head being dissected by a team in biohazard suits at the top secret facility. Santilli was very precise in the details he gave about the video, explaining how many rolls of film it had been on and even how much it cost him to procure them, and the video was widely taken to be the real deal. The “documentary” spread to over 30 countries, capturing the imaginations of the countless people who thought that this was finally the real evidence of what was going on at Roswell, and the “Alien Autopsy Film” became an absolute sensation at the time. Although there were obviously skeptics, there were also enough testimonies by supposed photographic experts and special effects wizzes proclaiming how real it all looked and how difficult it would be to fake it that a lot of people believed. It would alas be proved to be a hoax once and for all when Santilli himself admitted to the fraud. In 2006 he came forward to explain that the “Alien Autopsy” was all faked and even how he had done it, but even then there was some mystery remaining, as he claimed that although the “documentary” he had released was bogus, it had been a re-creation based frame by frame on real footage that had simply been too deteriorated to release. Hmmm. Whether there was ever another “real” video or not, this hoaxed footage has not aged particularly well, and looking back on it seems almost absurd that so many people were taken in by it, believing this now admittedly very fake looking alien dummy to be real, but believe it they did. There are countless other UFO hoaxes such as this out there, and these are merely among some of the more far reaching, sophisticated, and indeed amusing of these. Although it is unfortunate that so many people fell for these, in the end they do serve a purpose in showing us that we need to keep our eyes peeled for trickery, and approach the paranormal with an open mind but also a skeptical eye. In order to be taken seriously and to not give into panic or false hopes, to not be fooled and duped by such fakes, there must be a calm, measured and analytical approach to these things. In the end it seems very important to remember one thing- keep an open mind, but not so open that your brain falls out.